For the longest time the Faubourg on St Catherine (corner Guy) has simply been a place for me to get Phad Thai from Cuisine Bangkok. Recently, Yuki Ramen has caught by eye as there are two employees hand spinning Ramen noodles at all times. I can’t resist ramen knowing the noodles were stretched and boiled less than 5 minutes ago, so I finally gave it a try. As I ate and listened to the rhythmic slapping of the noodles on the counter, I couldn’t help but stare at the noodles being stretched and twisted with acrobatic precision. I ordered the Pork Soup with Sauce #3 and my friend ordered the Pork Soup with Vegetables #2. There were 8 options on the menu split between noodles with and without soup. Majority of the options were pork based but there were Beef and Chicken options as well. The Pork Soup with Sauce was delicious. 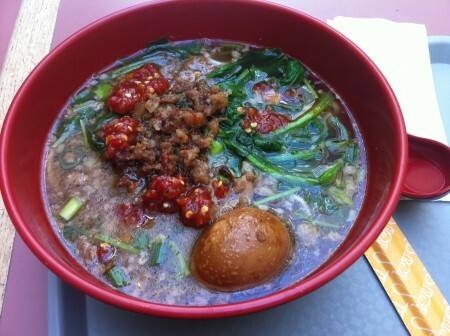 The broth was savory and salty (I added hot sauce) and included a hard boiled egg which absorbed all the flavor. The portion sizes were perfect and the price is fair (around 7.50$). I noticed the employees were speaking Mandarin and a recent review in the Mirror also noted that the soup tastes more Chinese than Japanese. Next time I plan on trying the Beef or BBQ Pork soup. It’s a great spot for a lunch or early dinner and the service was really quick. Tags: Egg, Food Court, Japanese, Lunch, Montreal, Porc, Ramen, Vegetable, Yuki Ramen. mmm, I went there a while back and really enjoyed the sproing and wheatiness (both words, I swear!) of the fresh noodles. I think I tried the BBQ Pork which was good, but I like that yours had an egg! I also really liked the little pickled condiment that comes alongside, yum.